1. This book is companion book to Advanced Protective Shelter Design (which explains detailed bunker design). 2. If you are interested in designs concerned with protection against conventional weapons see: Bunker Design (which is concerned with designing cut and cover type bunkers) and it's companion books Artificial Cave Shelters (with is involved with tunneled bunker designs) and Bunker Design Collection (which is a collection of historical bunker design examples). 3. We now have three Supplements to this book: Shelter Design Supplement, Shelter Living Supplement and Basic Fallout Shelter Survey. 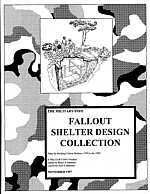 Shelter Design Supplement contains 17 additional shelter designs. Shelter Living Supplement adds information on stocking a shelter, emergency medical instructions, and radiation monitoring basics. Basic Fallout Shelter Survey has detailed instructions on evaluating urban and rural struction for radiation shielding.